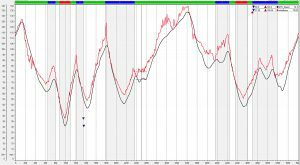 In the introductory pages of Data for Motorcycles, we briefly discussed tire rolling radius and GPS speed vs. wheel speed, and the potential errors that can arise when using a wheel-speed-based data acquisition system. Here we will address this issue and how to compensate for that error when using tire rolling radius in other channels. Figure 1: GPS speed is shown in black and wheel speed in red. Whenever the motorcycle is leaned over, wheel speed reads significantly higher than GPS speed due to the change in rolling radius of the tire. 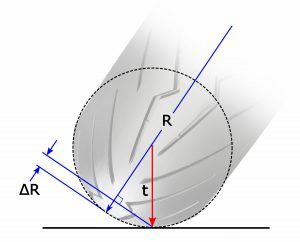 To recap, when a motorcycle leans into a corner, the rolling radius of the tires decrease, and this alters the relationship between measured wheel speed and actual ground speed. The most common evidence of this is in the speedometer, which will show a higher speed the more the motorcycle leans over, even though actual speed does not change. Wheel speed is typically measured by using a sensor that counts pulses from a transmission gear, a sensor ring, or some other set of objects. This count gives a number of wheel revolutions per minute or second, which is then converted to speed by multiplying by the tire’s circumference. Where the constants convert minutes to hours (60) and millimeters to miles (1609344). 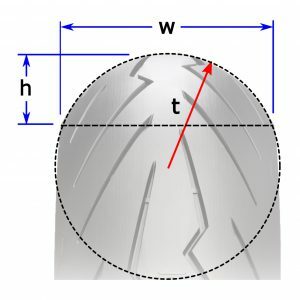 Usually we would use the outer circumference of the tire in the calculation and understand that ground speed may be very different from wheel speed when the motorcycle is leaned over. Figure 2: The same data but with wheel speed corrected using a Dunlop-supplied formula for rolling radius of the rear tire. Why is this important? 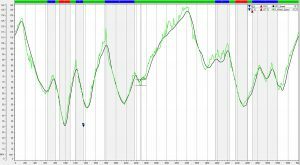 If we are using wheel speeds to calculate slip or other match channels, the more accurately that wheel speed reflects ground speed, the more accurate the other channels. 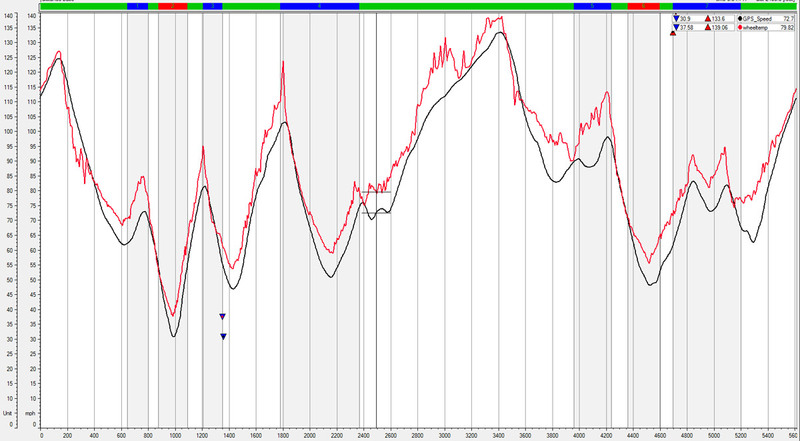 For example, Figure 1 shows data from a CBR1000RR, showing gps speed in black and wheel speed as calculated above. 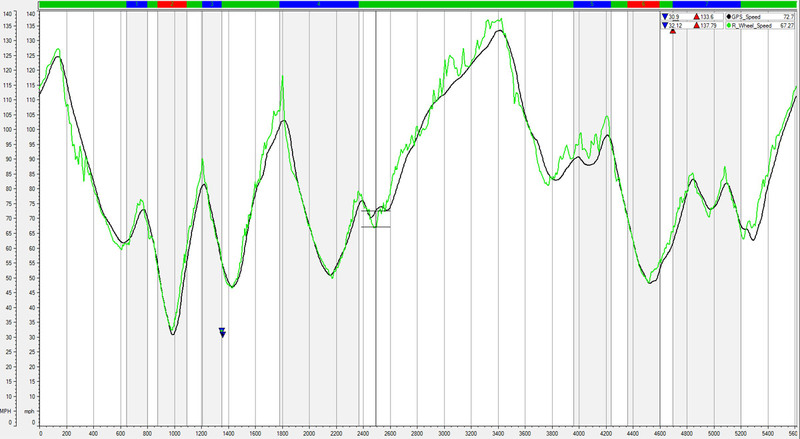 Note that wheel speed is significantly faster than gps speed any time the bike is leaned over. This equation can be substituted into the math channel for wheel speed to have it more accurately reflect ground speed, or any other channel that uses tire circumference as part of its input. Figure 2 shows the same data but with wheel speed corrected using a Dunlop-provided formula for tire rolling radius. Wheel speed more accurately reflects ground speed, and the channel is more useful for further calculations. 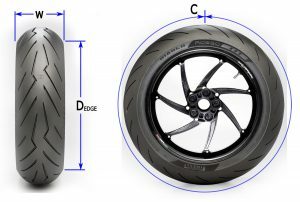 Width: Measure the width of the tire profile. This can be measured accurately by placing two straight edges on either side of the tire and measuring between them. Edge diameter: Measure the diameter of the tire at the edge of the tread, where the tread meets the sidewall. 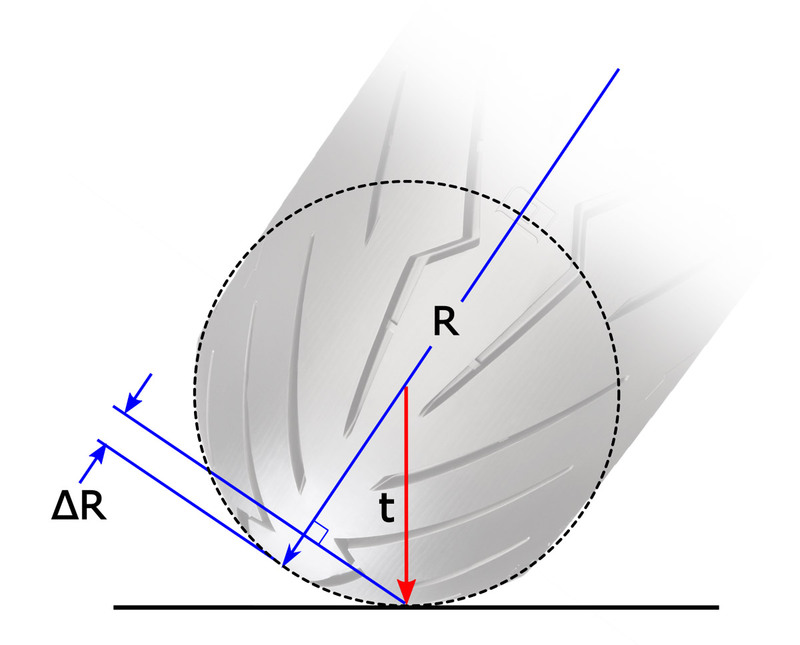 If we consider the tire’s profile to have a constant radius (t), we can find a value for that radius using the above measurements. Note that when we say “radius” here, we are referring to the tire profile radius, not the rolling radius. 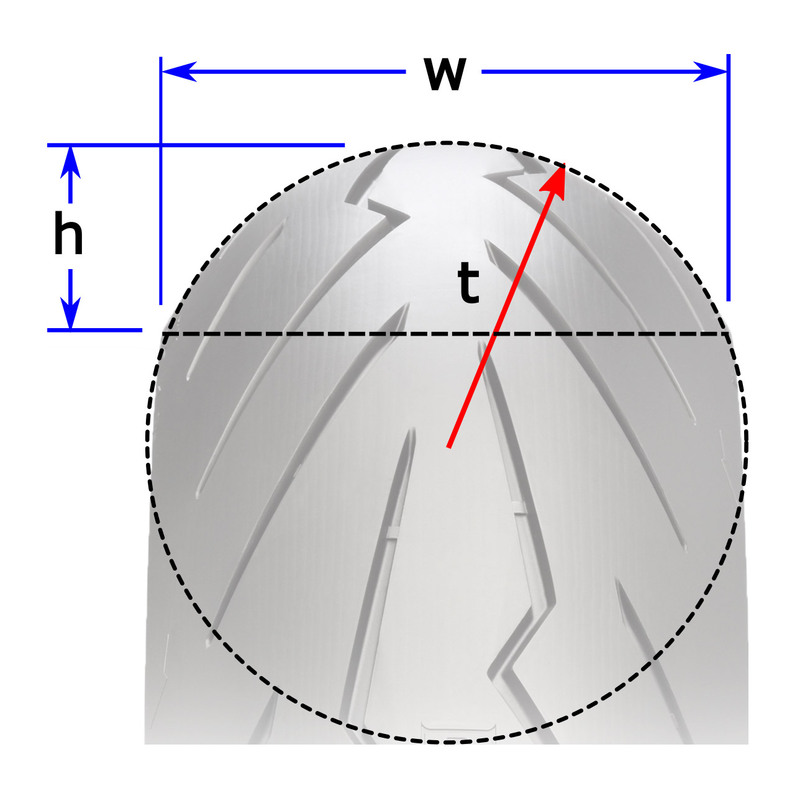 Figure 4 shows a tire’s profile with a circle having radius t superimposed, and the profile is defined by a segment of the circle with height h, which can be calculated from the measurements recorded. Where w is the measured width of the tire. 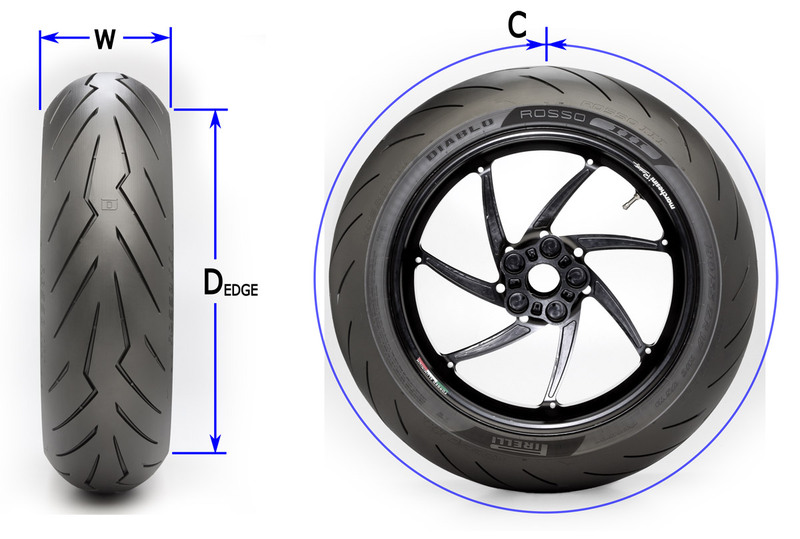 You can skip all this math and enter values for circumference, width and edge diameter here; values for the segment height and tire profile radius will be automatically calculated. Any units can be used, provided they are all the same (i.e. if you enter values in millimeters, the output will be in millimeters). where θ is lean angle. Where C is the measured, outer circumference of the tire.